On Jan 29th I benched a total of 2,450 lbs (that was 306.25 lbs for 8 reps). On Feb 26th I benched a total of 5,139 lbs (that was 571 lbs for 9 reps). So that's actually OVER double my bench total and I did in less than 30 days...and the crazy thing was they were the ONLY 2 days I did the nech press. And in this article I'm going to tell you how I did that. First off a small confession. I don't do the bench press often. I'm not fan. Generally it's taught incorrectly and performed even worse. 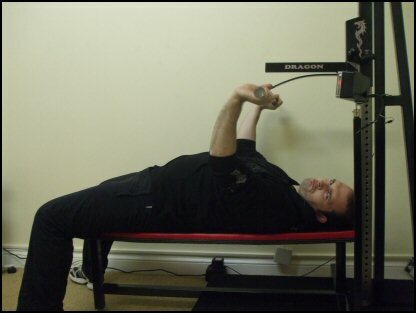 This leads to compression damage, joint damage to the elbows and wrists and blown rotator cuffs. In my full time medical practice I see the devastation bad benching causes every week. And....a further confession I nearly NEVER bench through a full range of motion. The reason for this is simple. It promotes injury. I'll do a bench press only within a limited safe range of motion, in a position where I am at my strongest. All that said, I still, occasionally perform a full range bench press. This is how I teach it. Start by lying on your back. Grab the bar with your arms slightly further than shoulder width apart, knuckles facing back to you. In this exercise, focus less on pushing out the arms and more on bringing the elbows closer to your midline. Focusing on this movement ensures the correct engagement of the fibers and the muscles. The movement should begin with your hands at the mid line of torso. Bringing the arms back further than this is unnecessary and runs the risk of injuring the shoulder capsule / rotator cuff. Further, there is NO NEED to bring the arms tucked in closer or flare them out. They should be at about a 45 degree angle if you’ve correctly aligned yourself. You start the movement again, by breathing out and tensing the abs, moving the arms forward in a smooth SLOW manner and stop just short of locking out. By this I mean NEVER extend or straighten the arm fully. Doing so shifts the weight off the muscle where we want it and on to the bone. The idea here and with ALL the exercises is to stress your muscles, thus you must keep constant pressure on them. If you let go for a second, you’ve screwed up. As you move back once you’ve reached the near lockout, you do so SLOWLY. Be aware of the muscles being used and when they are called into play. The elbows DO NOT NEED TO come behind you. Imagine if you were pressing the bar off your chest to the floor. That’s as far back as you need to go – level with your back, no further. Repeat this movement for your Time Under Tension. Focus on keeping the shoulders tucked down and tight against the body. Tense the lats. When you start to fatigue and weaken from this exercise, it’s natural to want to raise the shoulder to the ears and try to get more leverage. That’s a surefire way to blow out your shoulder. Failing that, you’ll almost certainly cause yourself back pain. You’re engaging the back muscles to bear the weight – and that’s not the point of the exercise. If that starts happening, you’re done. Ease the weight off and finish up. Finally, stick with a straight out chest press. Inclines and declines are a waste of time. They don’t “hit the muscle from another angle”. What they do is take you out of good structural alignment, meaning that you can handle less weight and you increase your risk of injury. It won’t make you chest bigger, it will blow out your shoulder. So stick with the simple straight forward press. Keep your breathing steady but shallow. See the diagrams below for more examples of correct alignment. The Secret of How to Double Your Bench Press with Isometrics is simple - don't bench press. Instead, use a variety of Isometric Pushup Techniques. This is a very simple exercise to do – but it certainly isn’t easy. It’s worth it though as it builds superb size and thickens the chest VERY quickly, based in part on my experiments and trials over the years, and the suggestion derived from Steve Justa in his bodybuilding works. 1. In the push up position, lower yourself to the half way point. 2. Breathe in for 3-4 and tense your muscles hard. 3. Concentrate on making your chest as tight and hard as possible. 4. After a few seconds you should feel like you’re shaking all over – this is your body working really hard – this is Isometrics. 5. Hold this Position for 2 MINUTES while practising very deep breathing as described in Perfect Body. 6. Slowly release – this is important, after intense contraction your body needs time to unwind. 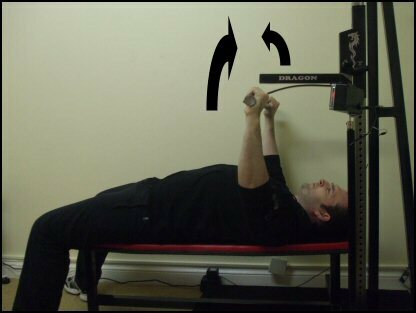 You've been reading How to Double Your Bench Press with Isometrics - check out some of my free Isometric Exercises for the chest here.